In addition to the various talks, courses and panels, we offer a variety of receptions and meals for your enjoyment. Some will require an additional fee. 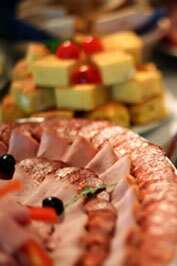 We typically choose low-carb, high-protein dining options to offer conference attendees. If you have allergies or specific dietary restrictions, please indicate your choice of options when you select your conference meals. Exclusive to young adults! Meet other young adults and gear up for a great weekend. Appetizers will be served and a cash bar will be available. A special lunch hosted by the Anthem Foundation for donors who are contributing at the annual level of $2,500-plus (new donors at this level are welcome to join us!). The Anthem Foundation board of directors and staff will be on hand to update you about our activities and to answer questions. Gift & Estate Planning Manager Kathy Cross presents an introduction to planned giving and ARI’s Atlantis Legacy. Topics include minimizing taxes through charitable giving and providing future support for the Institute while achieving one’s estate planning objectives. Strategies and techniques will be illustrated with real-life examples of legacy gifts arranged by Atlantis Legacy donors, with the donors themselves in attendance at the session. A lunch buffet will be served, compliments of ARI. No RSVP is necessary, and attendance implies no obligation. ARI will host a lunch exclusively for participants in the Atlantis Legacy, the Institute’s planned giving program, with special guest to be announced. Donors need not be registered for the conference in order to attend. Invitations will be sent in late spring 2014 to all donors who have included the Institute in their estate plans and informed us that they have done so.